For Kenya, lawyers wey dey act on behalf of prisoners don go court to get goment to torchlight moni wey dem dey pay prisoner. Di moni wey dem dey collect now na di same one wey don dey since 1979. Di prisoners dey push for increase ontop di 1 US cent per week (37 naira) moni. And no be evri prisoner dey collect di moni - only di ones wey don show to prison authority say dia behaviour qualify for am. 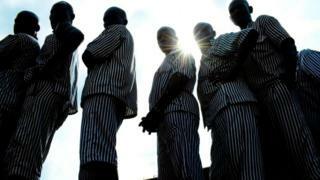 Prisoners work include to make furniture and oda goods wey authorities go now sell for di benefit of di prison service. Wen time don reach for prisoner to comot prison, all di moni wey don enta from im handiwork dem sell for am go now return to am. For court papers, di commissioner-general of prisons don defend di current rate of pay say prisoners no suppose dey collect moni wey dey fair, based on di kain work wey dem dey do. Im deny say dem don use style take turn di prisoners for slave-labour. Magistrates wey suppose rule ontop di mata on Friday but dem change mind come issue written judgement. Dem neva set new date for di judgement.